At Brennan Bodyworks collision center, we work directly with your insurance company to ensure that you get every benefit of the auto collision insurance for which you have paid. Some insurance companies will try to steer to you to a 'preferred shop' - one that puts giving them the lowest costs ahead of giving you the best repairs. The problem is that many of these body shops often operate on volume. This puts them under pressure to deliver more cars faster, and some technicians may not have complete training. These factors can lead to poor or incorrect repairs which may result in your car not meeting the safety standards designed by the manufacturer. That can put you and your family in danger in the event of another collision. As a certified collision center, Brennan Bodyworks can assure the quality you want at no extra cost. Insurers who understand the importance of quality repairs have recommended Brennan's for over 30 years, and we are proud to be certified by the world's leading automobile manufacturers for consistently superior work that exceeds their high standards. By law, the insured or the claimant - not the insurance company - has the right to choose the auto body shop that will perform repairs. 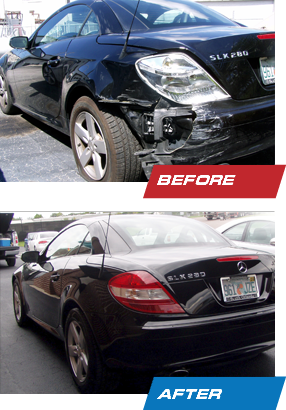 You want your car repaired the right way, the first time. At Brennan's we repair your vehicle to the manufacturer's specifications with original parts. We only use reconditioned parts when originals are not available, and with your approval. And we work with your insurance company to handle the details. At Brennan Bodyworks we will never recommend repairing a car that can't be brought back to factory specifications. And we won't cover up issues that could compromise your safety. Period. Often, damage that appears extensive can be repaired. Sometimes it can't. When that happens, we'll show your insurance company why it is a total loss and help you get a fair settlement. BE SURE TO SPECIFY BRENNAN BODYWORKS' CERTIFIED COLLISION CENTER WITH THE TRAINING, TOOLS & SERVICE YOU DESERVE!